Have you ever wondered how the world looked millions of years ago? Well, one artist took Pangea and put all the countries of the world on it. Have you ever wondered how the world looked 100 years ago? How about 10000 years ago? But we think we can do better than that: How the world looked 300 million years ago? This was a time before even the mighty dinosaurs roamed the Earth. A time in history when the plants and animals would be unrecognizable to us today, well most of them. You'll probably already know that at this time the Earth's continents were fused together in the supercontinent Pangea. This supercontinent would eventually break up and produce the modern configuration of continents we are all too familiar with. But what did the earth look like before the continents broke up? Let's take a peek. This length of time in the past is astounding really when you think about it. 1 million years ago is very difficult for us to actually comprehend, let alone 300 million years ago. This savvy teacher devised a way for her students to visualize this amount of time. Professor Roger Steinberg from Del Mar College hand drew a sheet of paper with 5000 dots on it. He then photocopied it 200 times and stuck them all together to show his students. When shown the paper, he asked her students to guess the number of dots they could see. Estimates ranged from 4.6 billion (the age of the Earth) to 13.7 billion (the age of the Universe). They were all shocked when he revealed it was only actually 1 million. Now imagine 60,000 of those sheets stuck together and you'll "get a feel" for the length of time we are talking about here. Given the average dimensions for A4 paper (21 by 29.7 cm or 0.06 m2) that would cover an area of 3600 m2! 300 million years ago puts as firmly within the Palaeozoic period of geological history, technically speaking within the Permian-Pennsylvanian boundary. This was a time of great change in the animal kingdom. Amphibians had evolved into reptiles that will one day give birth to all-conquering dinosaurs in a few tens of millions of years. The land was dominated by the ancestors of all mammals, the Synapsids, and the ancestor of all reptiles and birds, the Diapsids. Living Diapsids include crocodiles, lizards, snakes, and tuatara. The Synapsids would become a highly diversified group throughout the Permian ultimately evolving into the first mammals during the Triassic. The iconic apex predator of the period, the Dimetrodon, would rule the land. This chap, although looking pretty reptilian, is actually more closely related to you than the dinosaurs that would follow it. In the oceans, ammonites and ancient fish and sharks roamed the depths. Plant life on land was undergoing a revolution changing from the giant swamps of the Carboniferous to truly modern Gymnosperms taking dominance. How did the world look? At this time in Earth's history, the continents of the modern world were tightly locked together in the supercontinent known as Pangea. It is believed this assembly formed somewhere around 335 million years ago. It wasn't to last, however. The restless "gubbins" of the Earth would tear this assembly apart about 175 million years ago through a process known as plate tectonics. This gradual motion of the plates still continues today, in fact, Australia and India (they share the same plate), for example, are actually sliding northeast towards Asia and the central Pacific Ocean. Interestingly, this is happening at about 3.7-5.6 centimeters a year, depending on where you live on it. This would lead to the modern continental setup we are so very familiar with today. There are a plethora of images out there that show Pangea in her full glory. Most of these, however, will just give you an approximation of modern continental borders. What about if we mapped on the countries of the world? 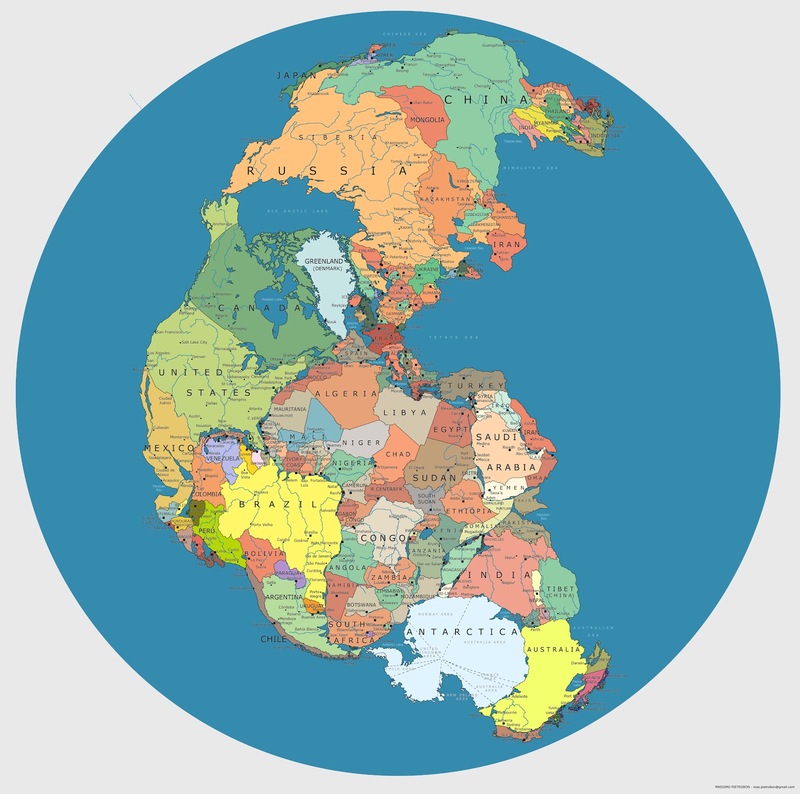 A couple of years ago, an artist, Massimo Pietrobon, created a map with the modern political borders on the ancient supercontinent of Pangea. Here's a better "zoomable" version. Now that really does put things into context, doesn't it? Very different indeed from today. Great Britain is no longer an island, in fact, it has land borders with France and Norway. Wow France and Britain touching borders? That would have led to a very different history between the two, wouldn't it? The United States now borders Morocco, Senegal, and Cuba. Canada borders Denmark, Portugal, and Spain. Brazil is now landlocked with land borders to Namibia and Liberia and others. Tibet, interestingly, no longer attaches to China, but actually Australia. Australia in turn borders Antartica which is in turn next to India, Sri Lanka and Mozambique. Imagine how much greater the empires of Alexander the Great, the Romans or even the marauding Mongols would have been in a world like this. Reminds us of those random world generators from Civilization. So there you go. That's how the world looked 300 million years ago. Cool eh? We've taken a little tour back to a time very different from today, All of the world's continents were fused together with some old bitter rival actually bordering one another. We wonder how the modern geopolitical relations would be in a world like this? Crazy.